We decided to venture away from Stirling engines and develop a Manson engine. We wanted to keep the design similar to our previous Nano Cannon engine so we kept the same base and burner, which runs from denatured alcohol (methylated spirits). This new Manson engine is called the Nano Disc. Our design approach for this engine has been the same as for all our engines, which is to fully design and simulate the mechanism in CAD before making any parts. Prototypes then get made and tested, small adjustment are made, new parts designed, made and re-tested until the engine is perfected. From the first prototype to the last prototype a huge increase in performance was achieved. What is a Manson engine and how is different to a Stirling engine? 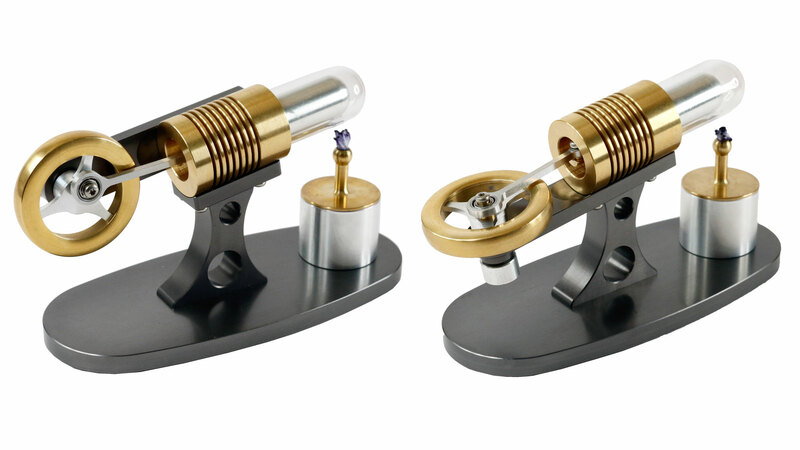 Stirling engines convert a temperature difference into motion. There is a hot side and a cold side to the engine. Provided there is a large enough temperature difference the engine will run. 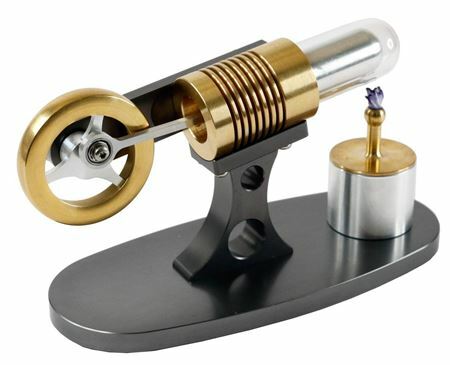 Stirling engines work by cyclically heating and cooling the air inside the main chamber. As the air heats up it expands, and as it cools down it contracts. This expansion and contraction drives a small piston which in turn drives the flywheel. Stirling engines have a mechanism for cycling the heating and cooling of the air built into the engine in the form of the displacer which pushes the air between the hot and cold sides. The displacer is driven by a connecting rod connected to the flywheel. In a Stirling engine only the air within the engine is used, it does not draw in or expel any air. It is effectively a sealed engine. 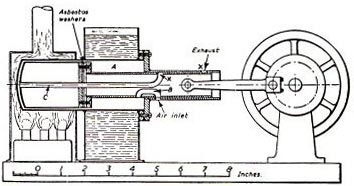 A Manson engine is very similar to a Stirling engine but with two major differences. Firstly a Manson DOES draw in and expel air. Secondly a Manson engine is able to have a single connecting rod and counterintuitively the displacer piston and power piston are on the same shaft and move at the same time. A Manson engine cycle is a little harder to grasp. At the top dead centre and bottom dead centre valves open briefly. The rest of the time the valves are closed. The valves just open to surrounding air. Both the displacer piston and power piston move together in the same direction at the same time. The clever bit is that at the end of each stroke a valve is opened. This releases pressure or vacuum so the next cycle can begin. When heading towards the heat, the displacer piston is shuttling air inside the engine to the cold side, cooling and contracting the air, which in turn pulls on the power piston. A valve is briefly opened relieving the vacuum pressure. This prepares the engine for the next stroke. The flywheel provides energy to push the engine into the next stroke. When the pistons are heading away from the heat source the displacer is shuttling air inside the engine to the hot side, expanding the air which builds up pressure and drives the power piston. A valve is briefly opened relieving the pressure inside the engine. This prepares the engine for the next stroke. The flywheel provides energy to push the engine into the next stroke. While developing and prototyping this new Nano Disc engine our workshop manager and designer Chris Guise had the idea to improve the design and performance of the conventional Manson engine. The improvements simplify the design, reduce production costs and improve performance of the engine. We think this makes it a new type of engine: A Manson-Guise engine. Manson engines are well known for the distinctive noise they make, and the Nano Disc engine is no exception. In operation the Nano Disc engine makes a lovely burbling purring noise. Manson engines seem to be fairly unique in the fact that they can run in either direction. In other words you can spin the flywheel clockwise or anti-clockwise and the engine will run that way. Our new Manson engine is called the Nano Disc, and we have two types on offer. Our standard Nano Disc (shown below on the right) has a horizontal flywheel. It seems a bit unusual to have a flywheel like that but it works and we think it looks good. However for those of you that like your flywheels to be vertical we have a second version for you. It requires one extra part plus some more holes to be drilled and threaded into the brass cylinder. We call this the Nano Disc Vertical (shown below on the left). Two options, your choice, performance is the same. We have recently come across a special coating process developed by NASA in the 1970s. They needed a way to lubricate mechanical surfaces in space. Oils were out of the question because of the extreme temperatures, so dry lubricant was required. Amazingly they found a tungsten compound that could be applied to parts. The tungsten coating is permanent, is very tough and wear resistant, is ultra slippery which reduces friction and increases performance. Furthermore it can handle high temperatures and never needs maintenance. It basically removes the need for lubricants. Other than the cost it has no disadvantages. We have been testing it recently and think it is brilliant. The Stirling engine is named after its inventor, Rev. Robert Stirling, who patented his idea for a closed cycle hot air engine in 1816. He also invented the improvement known as an economiser which is known today as a regenerator. From the around 1860 to around 1930 Stirling engines were produced in significant numbers. They were typically used for pumping water, as they had the benefit of being simple to use and only needing a fire; unlike a steam engine which needed water to begin with. By 1930’s Stirling engines had been mostly replaced by piped water, combustion engines and increasingly by mains electric motors. Importantly, Philips had been quietly working on a Stirling engine generator since the late 1930s mainly as a means to recharge radio sets as mains electricity still wasn’t ubiquitous. By 1951 Philips was demonstrating the MP1002CA generator. Sadly it was not commercially viable for numerous reasons including the introduction of transistors, better batteries and the spread of mains electricity. However all modern commercial Stirling engines can trace their ancestry back to these engines. In 1952 a Mr A. D. Manson wrote an article in Newnes Practical Mechanics regarding a novel hot air engine. This engine became known as a Manson engine. In 2000 Michael Ruppel of Germany made a slight alteration to the ports of the Manson engine and applied for a patent for the design improvement. This is now commonly known as a Manson-Rupp engine.